Show general stats for Viza. So the title is "Transgrab" - partly because it based on a my never-finished-and-abandoned-years-ago pocket pc remake of "Transplant" (one of my favourites from Amiga... http://tinyurl.com/5k47q3), and partly because of the element which makes it eligible to this session is the enemy grabbing. You can shoot around normally like in any other Asteroids clone, but your weapon is kinda weak... Fortunately your ship is equipped with the latest and greatest technology in the space miner/fighter industry - the Temporal Statis Field. When you press and hold Control, all enemy within a certain radius will "freeze", and attach to your ship with a force beam. When the button is released all grabbed enemy will hurled away from your ship at great speed. You can use this as a defensive device (stop incoming asteroids) and as a weapon too - the high velocity projectiles cause great damage on anything they hit. The only "enemy" type is asteroid for now, I hope I can do some more this week. I like the pixelicious look you have going on there. The most gameplay-affecting bug is that sometimes the grab seemingly not to function. Actually it *is* functioning, but due to the warping nature of the playfield, it "thinks" that an object near you is actually far-far away... This warping causes some other strange behaviour of the basic enemies too. I will fix it when I find some time to do it, for now I just draw faint grey lines at the "borders" to alarm you where to except strange things. Stupid solution, I know, but hey, time is pressing. The game only features a couple of levels, but you can easily create more if you want - Just edit the Data\levels.ini file, it is easy to figure out the meaning of things in it. The game levels are random generated within the limits set in this file, and there is absolutely no care taken to prevent stupid set-ups... So sometimes instant deaths after level start imaginable. The sprites of this game are from Transplant - I planned to replace them with my own graphic but I run out of time... I hope I did not infringe anyone's copyrights with this. Control - Holding Control will activate the Temporal Stasis Field. 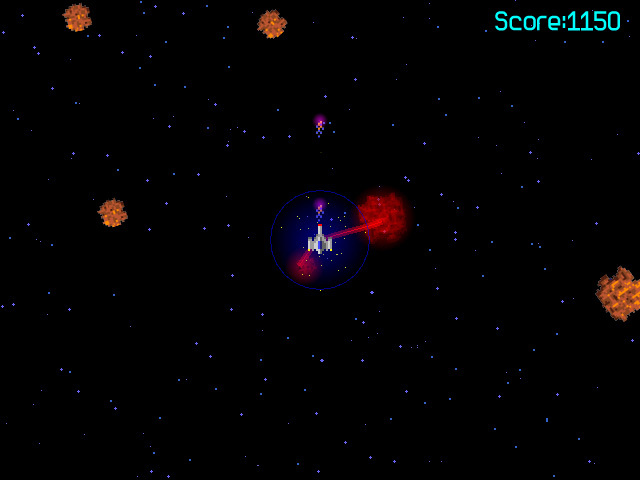 All the objects (enemies, asteroids) near your ship will be "grabbed", and attached to your ship with an energy beam. The energy beam will charge the objects. Releasing Control will fire the grabbed objects. I found it a bit hard to tell if I was doing damage to the little turret things until one popped out of existance. Still, I had fun flinging rocks at things. I know it's after the deadline, and as I see form the download counter on my previous post I'm a little late with this, but I fixed the most annoying bugs in my game, and uploaded a new version. So, if you did not downloaded yet, or simply just happen to be here and reading this , please download the zip attached to this post instead/again. I'ts way better. Believe me. I'm really sorry but I can't play this game for too long. The camera rotating really makes me dizzy ^ ^;; (I don't usually play FPS either so it isn't just your game!) Although I have tried it and I had fun throwing rocks into the other hehe. I wish we could rotate the captured objects without having to rotate the ship though. It seems like you removed the enemy turret from the 2nd prototype, no? On the first level there are only asteroids... On the second there are some additional turrets... On the third, the basic enemies are coming... And on the later ones the different combination of these. Maybe it take too much time to clear each level... If someone wants to save some time, just edit the levels.ini, in the Data folder, and add a turret = 5 and basicenemies = 5 lines to the first level ( the [ 0 ] section in the ini file). Ohh, and all the enemies can be captured, and hurled around, not just the asteroids! This is really cool! I actually like the rotating camera for some reason. Nice job!